Last year Rohit Prasad was ranked 9 and colleague, Tony Reid, was ranked 10 in Fast Company's 100 Most Creative People in Business. Amazon's Alexa has taken the world, including India, by storm since its release in 2014. From commanding it to play music to control your smart appliances, Alexa is the next gen technology that is poised to make one's life simpler. While the fanfare for Alexa is quite obvious and noticeable, did you know that Alexa has a very strong Indian connection? 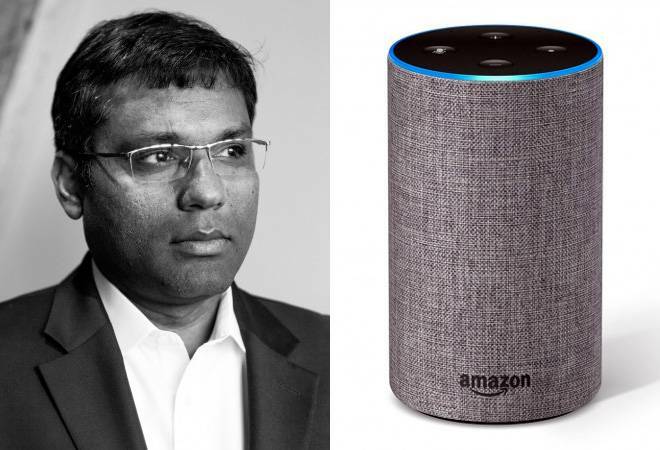 Alexa was created by Rohit Prasad, along with colleague Tony Reid. Prasad has been serving as the Vice President and Head Scientist in Alexa Artificial Intelligence since May 2016. He is at the helm of research and development in speech recognition, natural language understanding, and machine learning technologies aimed at improving customers' experiences with Echo devices, powered by Alexa. Hailing from Ranchi, Prasad attended DAV Public School, following which he pursued engineering in Birla Institute of Technology, Mesra. He pursued his masters degree in Illinois Institute of Technology where he researched low bit-rate speech coding for wireless applications. After a hiatus of around 9 years, Prasad pursued an MBA degree from Massachusetts Institute of Technology - Sloan School of Management in 2008. His first stint in the field was as a Staff Scientist in BBN Technologies in 1999, where he worked till 2013. At the time of leaving BBN Technologies, Prasad was serving as the Deputy Manager and Senior Director, Speech, Language and Multimedia Business Unit. After that he joined Amazon, where he served as the Director of Machine Learning till 2016. In 2016, he became the Vice President and Head Scientist in Alexa Artificial Intelligence. Last year Rohit Prasad was ranked 9 and Reid was ranked 10 in Fast Company's 100 Most Creative People in Business. They were also ranked 15 in 2017 on Recode's 100 people in tech, business and media who mattered. Prasad and Reid joined the ranks of bigwigs like Tim Cook, Elon Musk, Susan Fowler, Jeff Bezos, Mark Zuckerberg, Sundar Pichai and Satya Nadella. Talking about his brainchild and what makes it click, Prasad said, "Another important reason for adoption of Alexa is the wide array of intents she can understand and respond to, revolutionizing daily convenience such as accessing and playing music, books, and videos, controlling smart devices in the home, communicating with friends and family, shopping, setting reminders, or getting information you need," as mentioned in The Amazon Blog. The future of AI is bright, he believes, and it will only get smarter from hereon. "In the next five years, we will see conversational AI get smarter on multiple dimensions as we make further advances with machine learning and reasoning. With these advances, we will see Alexa become more contextually aware in how she recognizes, understands, and responds to requests from users. Alexa will become smarter more quickly as unsupervised learning will dominate how she learns," he said. One of the best examples of Alexa's smartness is its use in India. In an interview with Times of India, Prasad said that here people ask questions like "weather kya hai". Additionally there are different languages and even varied dictions. He added that Alexa tackles all this very effectively today. He acknowledged that he is very happy with Alexa's Indian accent that does not sound funny at all. However, in India there is a unique problem. Indians have a habit of saying 'achcha', which sounds like Alexa to it and it wakes up. Prasad says that they have taken steps to differentiate the two for Alexa.